This is the latest adventure for the ferocious green giant The Hulk, where he seeks his ultimate revenge. Play up to 25 lines and win a maximum of 5,000 times your line bet. The game has 3 progressive jackpots shared with all other Marvel super heroes’ video slots and a free spins feature.Play this game for free with £5 no deposit bonus offered by 888games! The Hulk substitute for all symbols except for Explosion Scatter. 3 or more Explosion Scatter symbols trigger The Hulk bonus game in which prizes are awarded in the form of free spins and multipliers. Win combinations pay from left to right except for Explosion Scatter. The prize is doubled when The Hulk substitutes in a winning combination. Marvel jackpots are awarded randomly - no matching symbols required. 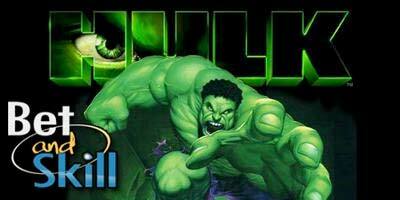 "Hulk - How to play - Demo - 5 pound free - No deposit bonus"